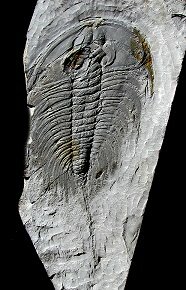 Size: Trilobite is 6.1 inches long! This is a very large and very collecttible Lower Cambrian trilobite. It is a HUGE Olenellus getzi from Lancaster, Pennsylvania. This specimen was discovered in 1982 - over 30 years ago - in the Getz Quarry. This long-closed quarry is the ONLY locality in the world where TRUE Olenellus getzi were ever found. This specimen has excellent detail preserved - a very distinct fossil! The natural darker coloration of the trilobite contrasts well with the surrounding rock. This impressive bug (over SIX INCHES LONG!) is well showcased on the large matrix block. Finding a trilobite this size and quality from the Kinzers Formation is extremely rare, but ONE FROM THE GETZ QUARRY is nearly impossible! This is a HUGE, ultra collectible example of this famous Lower Cambrian trilobite from Pennsylvania, again, found over 30 years ago.